This photo was taken on January 5th 2019 at 6:20 AM. The location was on the outer edge of Georgetown in Washington DC. 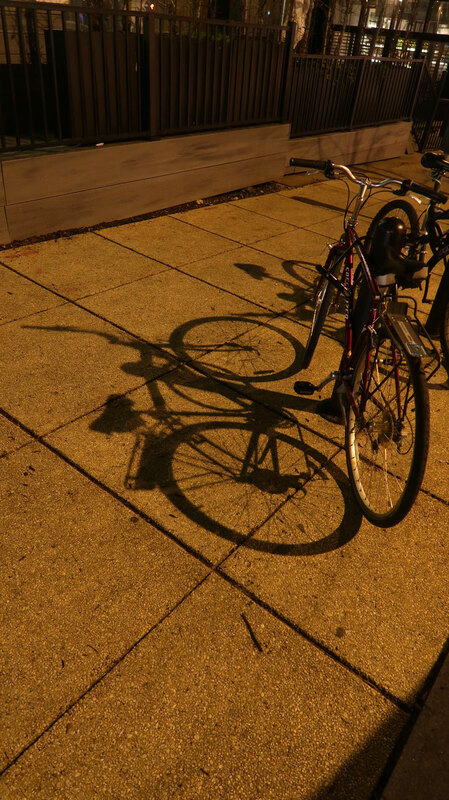 The "Take it!” came with little hesitation as clarity of the shadow cast of this bicycle was so strong due to the proximity of the light cast off from an adjacent street light that it almost gave the illusion of the bike having fallen down. Just for the spice of it* - I walked on/through/over the shadow and did not have to avoid any of the upages had it been a real fall over - lol. The world of shadows is one of the great tandems available to us. * In some of us, the "kid" is a life long internal companion. That walk through the shadow by me, was an automatic - lol. My internal kid stopped aging at 13. I can't show this one to my daughter. She wants a "Big girl" bike so bad, but she's still a little to young for one. The shadow is almost perfectly proportional. Its odd how the handle bars shoot straight up in the shadow, unlike the actual bike.